Botox is our most frequently used and popular procedure, and one of the most popular cosmetic treatments in the world. In the past people thought only the rich and famous got Botox and were often put off by common misconceptions or horror stories. Thankfully times have changed and as it has become more acceptable amongst the wider community, most people know that these stories are often just that, and when done correctly there are many benefits a little Botox can have. Although it is often still not talked about, or people will only tell their closest friends, it is becomingly an increasingly more common procedure. It is also becoming more frequently used by those in their 20's to 30's as a preventative measure. With over a 20-year safety record for cosmetic use, FDA approved, and manufactured by Allergan, Botox is very safe when used correctly and within the recommended doses. Botox works by blocking signals from the nerves to the muscles causing the muscle to relax and the overlying lines or wrinkles to soften, and with continued treatments can help prevent new lines from forming. Botox is charged by the unit. The number of units required is dependent on the individual person. Best results are seen when the dosage is worked out correctly and artfully tailored to our unique faces to ensure we are given the correct dose whilst still looking natural, just a bit fresher and more youthful. In using smaller doses more frequently we can achieve natural results without looking overdone. If you would like to find out more, please phone or email us for a cosmetic consultation. Actual CosMedic Clinic patient. Results may vary. Unretouched photos taken before treatment and 2 weeks after treatment. Images are for CosMedic Clinic use only. 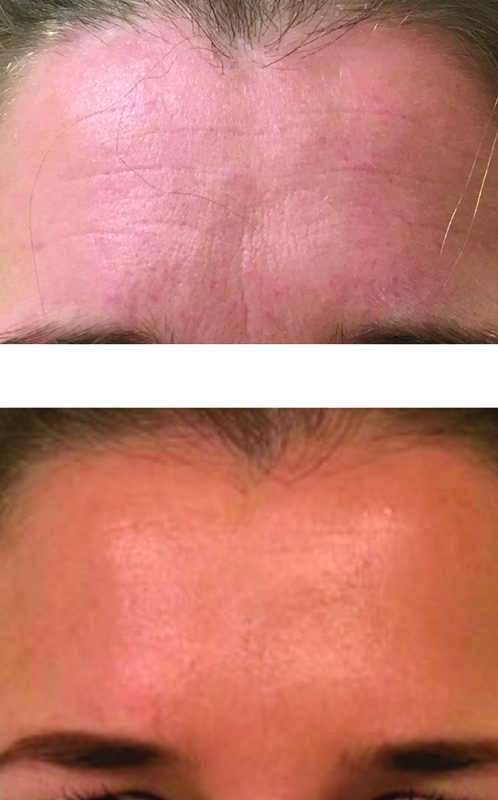 Client received muscle relaxant to soften her frown lines, forehead lines and crows feet. 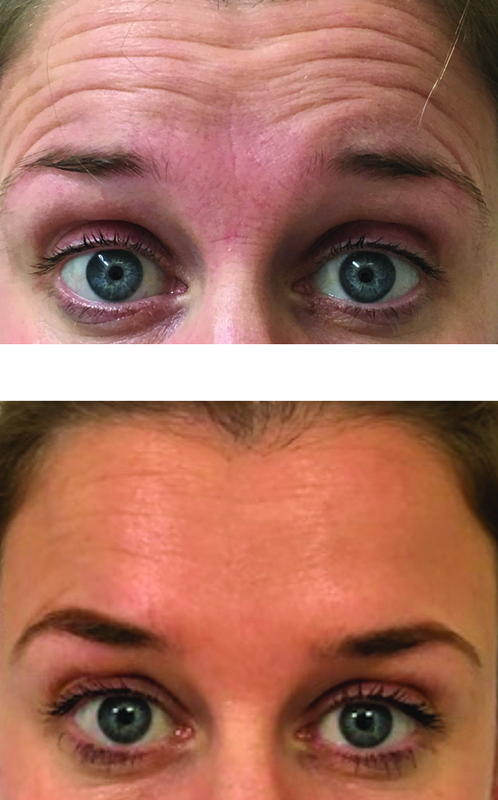 Client received muscle relaxant to soften her frown lines, forehead lines and crows feet and to achieve a slight eyebrow lift, which freshens and highlights her eyes. Botox Cosmetic has been FDA approved for cosmetic use in 78 countries and is the number one selling product of its kind in the world. It contains tiny amounts of a highly purified botulinum toxin refined from the bacterium clostridium botulinum. It has been safely used for more than 20 years in cosmetic uses. Botox is manufactured by the company Allergan. Always make sure you are getting authentic Botox by seeking a reputable provider who purchases Botox from Allergan. If you are unsure, ask to see the vial of Botox, it will have the Botox cosmetic logo and a holographic image that says Botox. Botox takes about 1 to 2 weeks for the treated muscles to become temporarily relaxed and the overlying lines to smooth out. 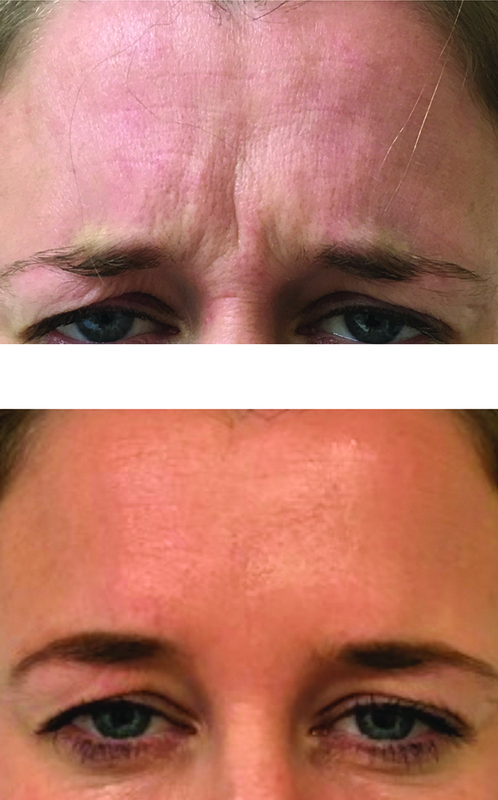 It depends on numerous factors as to the extent of reduction Botox will have on these lines, such as how deep the lines are initially, the dose injected, the strength of these muscles and the age of the patient. Most people respond very well and with regular treatments every three to four months results can last longer and the lines continue to lessen over time. Botox is best used to gently and subtly soften lines whilst still allowing you to retain natural expressive facial movements. Results can last anywhere from ten weeks to four months depending on the area treated the dose injected, what we are trying to achieve, and how well you respond to the treatment. In most cases it lasts between three and four months. If you are lucky it may last longer. To maintain desired effects it is recommended to have further Botox treatments every three to four months. Lower doses more frequently are best for a natural result. A recommended treatment plan would be discussed with you at your consult, and as everyone is unique, and we all respond slightly differently it can often take a couple treatments and tweaking to work out the best treatment plan for you. This is why it is essential to come back for your follow up appointment after your initial treatment. If you have not had Botox before you will need to have a consultation first. This can either be done as its own appointment and will take approximately 30 to 45 minutes, or provided there are not contraindications to treatment, it can be done on the same day as consultation and will take 45 to 60 minutes. Future Botox treatments will take 30 minutes, but the actual injections themselves take less than 10 minutes. People often describe it as a slight sting. The sting only lasts a couple of seconds. The needles are extremely fine microneedles and depending on the area injected sometimes you barely feel it, whilst other areas can be a little stingier. It is very tolerable. Temporary side effects can include pain at the injection site, occasional bruising, swelling and redness, and in some instances a mild headache. in rarer cases a heavy eyelid that can last about four weeks. It is important to seek a provider with experience to prevent any potential undesired results from poor injection techniques. The cost for treatment is dependent on the individual and the area being treated. A specific plan will be tailored to the individual on consultation. It is generally very affordable in comparison to other beauty treatments, especially if you compare on a yearly basis, as you likely will not get Botox injections as regularly as you may for example have your hair coloured. We charge $19/unit and offer a customer loyalty programme. We are also able to offer payment plans with Genoapay or Automatic Payment options. People often think that if they stop using Botox they will look worse than before they started. If you stop using Botox your muscles will simply start working normally again. It could take some six to twelve months for this to happen but when it does you will just start to form lines as you did previously where you had been getting Botox. If anything, you would of slowed down the aging process in the area you were receiving the injections for the duration you were having treatment. There is no downtime. You can return to work or most normal activities directly after treatment, so long as you do not do anything to cause pressure to this area over the next four hours, and stay upright following treatment. This includes no strenuous exercise, saunas, hot yoga, alcohol, massage to the area or any other activities that could potentially cause pressure. You may have some temporary redness and swelling, but this usually goes down with half an hour, and although bruising is unlikely if you develop bruising, this can easily be concealed with makeup. You need to refrain from any facials, or face treatments, including facial massage for one week after injections. Certain herbal and natural medications can increase your risk of bruising such as Omegas, Fish Oil, Tumeric, Vitamin E, and Green Tea. Most people will discontinue these about one week prior to treatment and one week post treatment to help further avoid bruising. Please do not discontinue any medications that have been prescribed to you from your Dr.
We aim to give a gentle softening creating a more natural look, by using small amounts of Botox more frequently, tailored to the individual. More people are becoming fans of the "less is more" look and moving away from the frozen fake look that was more popular when Botox first started to become recognised, and not within due time. You can expect subtle changes and a softening of the lines, with lift in some areas of the face, whilst still retaining some muscle movement to allow for facial expression. This is a common question and one that is often asked. Generally speaking the answer is No. If it is done correctly then people will not know. If they are having it done themselves or are curious about Botox, they may have their suspicions but would never know for sure unless you told them. Clients often say that they get comments about how good they look, and people may ask what their secret is, but it is up to you if you tell them. CosMedic Clinic is owned and operated by Registered Nurse and Cosmetic Nurse Jaime Squires. Jaime has extensive experience in Botox, having worked fulltime in the industry for seven years and attending regular training sessions and conferences to ensure she is updated on the latest techniques, safety procedures and recommendations. Jaime is very safety conscious and keeps up to date with CPR training, and the latest research on safety protocols for cosmetic treatments, as well as regular in house and online training and conferences. If you visit the clinic you can find the safety protocols and certificates of her qualifications on display. As a client you have the right to know the training, and experience of your cosmetic treatment provider and should always ask to see evidence of their qualifications and safety protocols if you are unsure. She has oversight by Dr Henryk Poczwa from the Vein and Skin Clinic, who is a member of the New Zealand Society of Cosmetic Medicine (NZSCM). Dr Poczwa visits Invercargill regularly to preform vein treatments out of Southern Cross Hospital. Jaime is extremely passionate about Appearance Medicine and Skincare treatments, and takes pride in making her clients look and feel their best. She is dedicated to her clinic and her patients, and works full time here to make this her area of expertise. She is readily available should her clients have any concerns post treatment, and has a very high safety standard. Beware of places offering discounted treatments and cheap rates and ask to see the vial of Botox. Be wary of those offering packages that lock you in to long term treatment plans you may not be able to get out of. Remember the dose required to achieve best results varies so what is right for one person may not be for another and your dose will often need to be adjusted slightly to account for this when starting treatments. Nobody is generic so neither should your treatment plan be and whilst botox may last four months on one person it may only be three months on another, and this can often take a couple of treatments to determine. Ask your practitioner if they have the treatments themselves and check to see if they look natural. Ask what training they have had and what training if any and conferences they have attended since. Don't just ask your provider how long they have been in the industry ask them how many hours per week they treat clients, as they may only do a few hours per week, which would be the equivalent of one years work spread out over five. Check they have management plans in place, and the medication in their clinic to treat any potential adverse effects. It is important that your practitioner explains how your treatment works, expected results and all potential adverse effects. Also ensure that they give you an after hours contact number and are readily available following your treatment should you have any concerns.